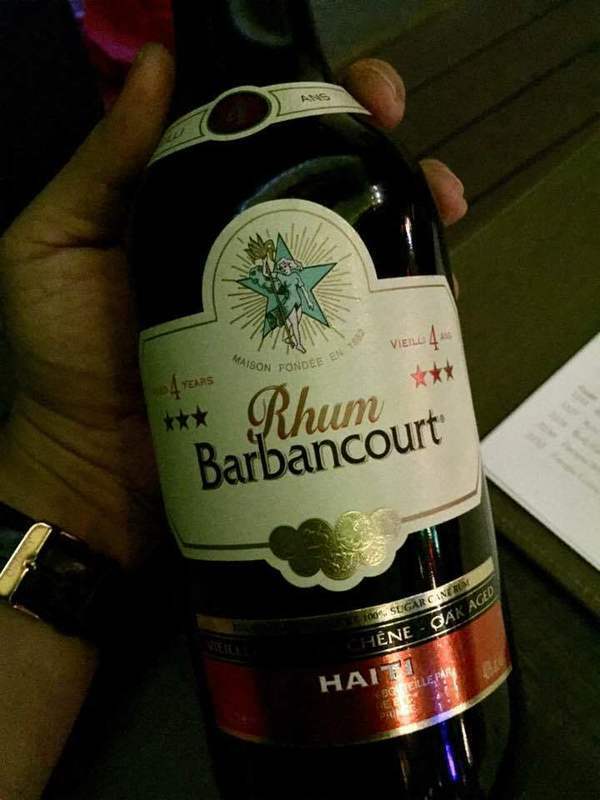 Have you found an online vendor selling Barbancourt 3 Star 4-Year? Un haitien... Forte présence de vanille. Bcp de corps mais moelleux malgré tout. Rond comme il se doit. This was the first rum that reminded me a bit of a Scotch. It is strong, but also sweet and oaky. There are no words. Similar taste with Stroh, only less alcohol. For just a few dollars more you can get the much better 5-star 8-year-old version. This 3-star rum is 4 years old, and has a very thin, grassy taste. I used to put it in Mai-Tais along with a dark Jamaican, but there are so many better-tasting, aged agricoles out there. Not a terrible rum, just really unnecessary. Picked this one up on an end of bin clearance to try my first anything from Haiti. High-end mixer, yes, but can’t drink it straight up. Nose is complex with oak and smoke, but taste is just too much alcohol and also very little mouthfeel. I have gotten wrapped up in my theory that 3-4 years is optimum aging for rhum agricoles. Since I have their 5-star 8 year and like it, I figured that this lesser aged one could be better. Wrong! The 86 proof really burns the tongue and it needs to breathe for about 30 minutes to be able to drink neat. My theory may hold for Martiniquan agricoles, but not for rhums from Haiti. Update one month later: All this rhum is good for is mixing with ginger ale similar to my same recommendation for Angostura 5 Year. Ok avec du thé glacé ou du coke. Pas très bon sur glace. I picked up a few of these bottles when iI was in Haiti a few years ago and forgot about them in the back of my bar, I did not miss much. The initial nose is a little flat, and too much burn to smell anything else. If you try hard you will find some tobacco, leather and vanilla. The initial tase was sugary but gave away to bitter and burn too soon, it finished up with some sugar cane. As a sipper it did not cut the mustard, but it was fine in a mix drink. I Remember all my memories were good with this drink. a 3 star Rhum I would not miss but the 5 stars is a thing to miss. my haitian friends first offered me this drink at their house in Boston, when I was 19. a non drinking age for that state. when I go to liquer store checkin out all the good beers I must say this rhum calls me like Jumanji. $23.although I drink red label and as I age I can drink hard liquer, 4 star haitian rhum is always has a character and my drink of choise in rhum on the rocks.... ı prefer bacardi and fresh coconal make the juie myself to make pina colada. u will understand when u go to a caribbian party with the food..everybody drinks Rhum barbancourt and prefered beer. it is a cultural summer drink. for the price it is a fun original bottle always in my basket. This is a nice rhum. I will admit it is my first agricole but I can't say there is anything bad or offensive about it as others seem to. The nose is alcohol, no doubt about that, but its a young, light, agricole so can I pretend to be surprised? no. Palate is nice and has complexity and development. It drinks almost like a whisky, initially soft and round with some light caramel notes as well as a bit of brown sugar. There is also a kind of hard to place sharp-sweet flavor going on, kind of a super light funky sugar cane taste on the mid-palate. Finish and aftertaste leaves this little (tiny) funk and sugarcane as well as a slow and subtle burn which is actually quite nice. Overall, it's a fine rum, seems to be a nice intro into the style and the region. It's not mind-blowing but it is what it is. I wouldn't seek it out to sip unless youre really a connoisseur of the style but I do think it's very nice as a one-time sip and a mixer for tiki or craft cocktails. Wouldn't put it in a cuba libre or anything like that... it isn't THAT bad. EDIT: After trying other agricoles this is the most subtle. Honestly not a good representative of the style but decent in its own right. 43% ABV. Pot still. Cane juice. Nose: Hint of creamed corn. A good amount of brine. Some oak. A savory note I can't place. Hint of something medicinal. Caramel underpinning it all. Fairly creamy. If you breathe really deeply, some alcohol. Many of the same notes follow on the palate. Shortish finish. I was fairly impressed by this one. It's quite good! I truly can't understand the low rating (5.2 at time of writing). Are people expecting a rich, creamy, sugar-and-vanilla delivery mechanism? That's not what this is trying to be. And certainly, in my opinion, it punches above its weight. Barbancourt 3* is an excellent, affordable, and widely available introduction to agricole-style rums. Definitely not as complex and tasty as the 5 Stars but deserving a higher average rating than 5.0 at the time of my tasting. For those who prefer sweet rums, this is NOT for you. I, however, like my rums neat and dry and this fits the bill. Some refer to the taste of Barbancourt 4 yr rum as being somewhat reminiscent of Brandy or Cognac, neither of which I am familiar with. I rather enjoy this rum as it is also different than most I am familiar with. Now, if I could only get my hands of their 15 yr version! This is one of those bottles that I'm glad to say I have had and will never get again. What a disappointment the Barbancourt 4 year old rum. I have tried over 700 aged rums over the past 15 years and this is amongst the worst of them all. This is rat poison disguised as an "aged" rum! I made the huge mistake of listening to the clerk at my local liquour store who adviced me to buy this... my god what do they make this with? is like pure rubbing alcohol. I had one zip and left the bottle almost full on the bottom shelf of my minibar as decoration. Never again. This is my favorite Rum! Dry agricole rum made from sugarcane juice not molasses in Haiti. Bright flavor, not too fancy just good rum. True pirate Rum with it's simple old school bottle and label. Smooth with a little bite, I like to drink it straight out of the bottle, arrrrrrr. Clean liquor never a headache from this stuff. Even as a mixer, was not as smooth as I would have hoped. Have it as a 4.5 on my chart.